I'm only half-way through knitting the pair of sunset socks, so what better time to start the next project? It's not unreasonable to start this next project asap, because it's going to be a special birthday present for a special person. (The birthday isn't far away in terms of my knitting speed.) There's no danger that the sunset socks will be forgotten, because putting that first one on felt so good! There was an effect I noticed and liked while spinning the sunset socks; when black became flecked with a changing colour. So here's the dyed merino weighed out for the next pair. 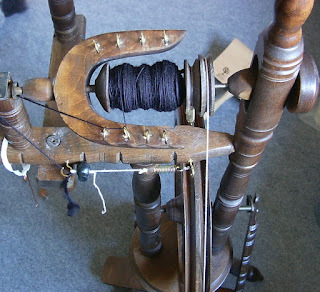 I'll spin one bobbin entirely in black, and another in alternating colour. For reasons of rapidly approaching birthday, I'm returning to the wheel. Having done quite a lot on the drop spindle recently, I'm surprised at how much quicker it all happens on a spinning wheel. In an hour or so I've done the first 20g. I cant wait to see these develop- all my favourite colours- I like the look of all that black!